Happy Friday everyone! I wanted to pop in and apologize that Treasure Hunt Thursday was not up. I fell behind and needed a break but I promise it will be back next Wednesday evening! In the meantime I thought that I would share with you all a sneak peek at what I have been up to. I brought out my fall bins and got busy even though it has been nearly 90 everyday. The bakers rack has been tweaked a bit since I took this pic and I can not wait to share. I could not resist taking a pic though while I was in the middle of brainstorming just how I wanted it to look. 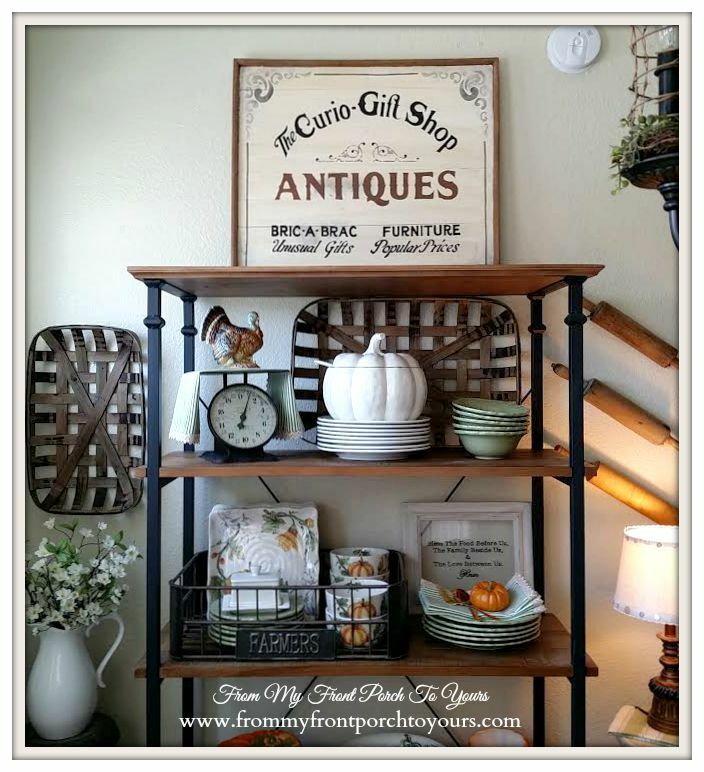 On a side note I LOVE my tobacco baskets that I ordered last month from Decor Steals. I changed out the chair next to the fireplace. This chair has a twin and they use to be in the dining room and then moved to the office. Nobody ever sits in them in there but me so I figured it was OK to borrow it for awhile. The fireplace mantel is all decked out in fall splendor. I can not wait to share it with you all! 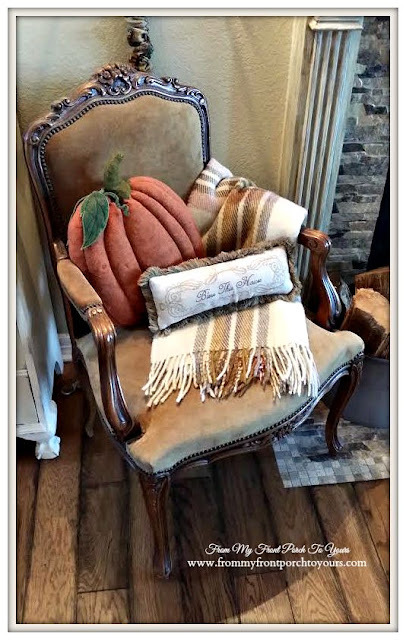 Till then visit my fall mantels from years past- 2011, 2012, 2013, and 2014. Which one is your favorite? 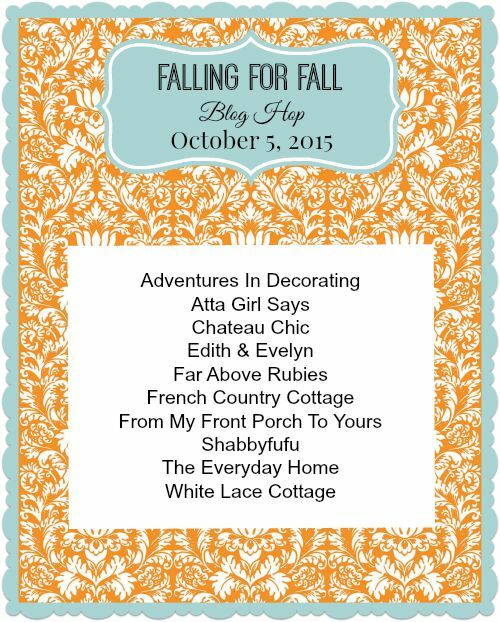 Please join me and 9 of my wonderful blog pals on October 5 for our Falling For Fall Blog Hop where we all will be sharing touches of fall in our homes. Now I must get back to my current project which I think I made harder for myself instead of easier but I will share more about that in my next post. Ooh, Pamela, me likey! The Baker's rack looks great with your baskets, and that chair with throw and pumpkin pillow are awesome! 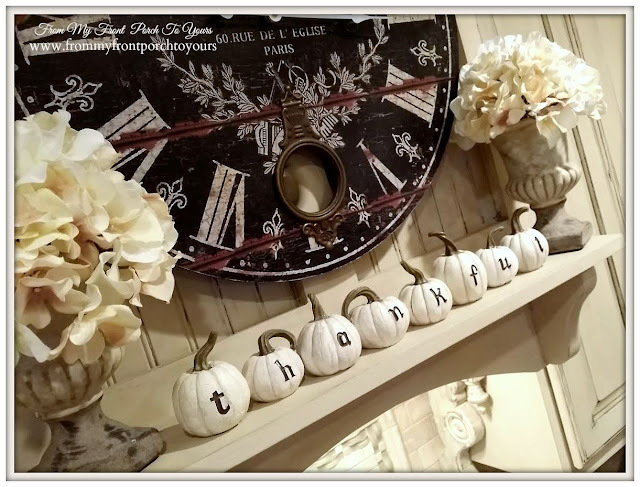 I just love those little white "Thankful" pumpkins, Pamela! I think your baker's rack looks fantastic as it is, but now I cannot wait to see what changes you made to it. 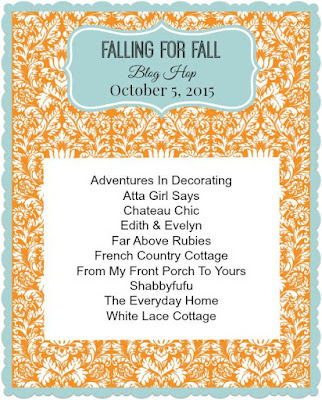 Looking forward to the Blog Hop next month. Love the peeks...can't wait to see more!! Ahhhhhhh Pamela swooning so lovely. Love that antique sign. Everything looks beautiful. So, so pretty Pamela, can't wait for the whole tour! So very beautiful, I just love your style and creativity!